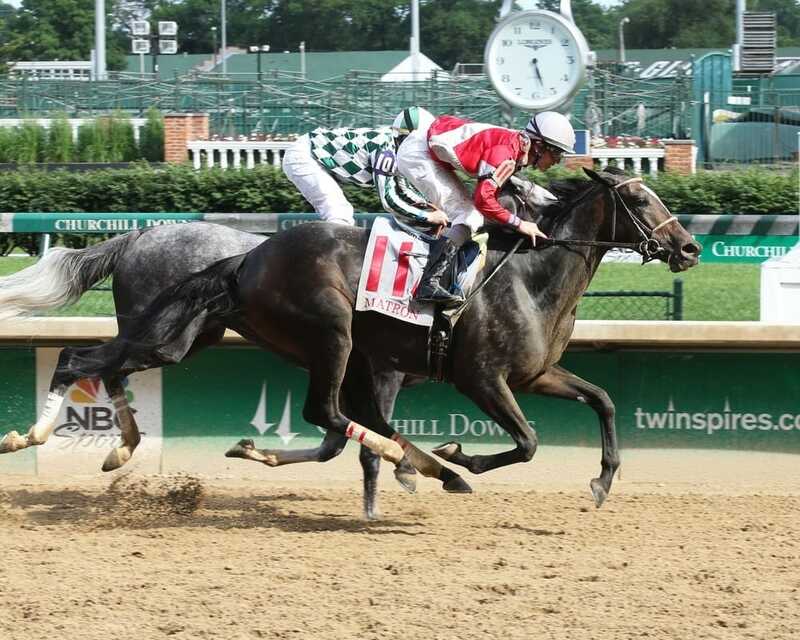 LOUISVILLE, KY – Whitham Thoroughbreds LLC’s Walkabout ran down Improv in the final strides to post a neck victory in Saturday’s Grade 3, $100,000, Matron at Churchill Downs. Ridden by Brian Hernandez, Jr., for trainer Ian Wilkes, Walkabout clocked 1 1/16 miles over a fast track in 1:44.06 to beat 10 other fillies and mares in dramatic come-from-behind fashion. Belle Hill and Improv flashed early speed and led the field through the first 1/4 mile in :23.52 before Improv inched ahead down the backstretch, finishing a 1/2-mile in :47.03 and 6 furlongs in 1:11.57. Walkabout had one horse beat early on and trailed the leaders by as many as 15 1/2 lengths after the first 4 furlongs. Improv, ridden by James Graham, looked as if she might steal the race at odds of 28-1. She had a 2-length lead at the top of the stretch, but Walkabout was hitting her best stride late. Hernandez swung the 4-year-old filly eight-wide on the turn for home, overcame mild contact with rival Tiger Moth in mid-stretch, and powered home to spoil an Improv surprise. The Matron was Walkabout’s first stakes win, an important milestone for any future broodmare, while banking the $58,280 first prize. Divine Elegance was another 2 1/4 lengths back in third under Miguel Mena. Crooked Stick, Weep No More, Tiger Moth, Curlin’s Approval, Shes a True Beauty, Belle Hill, Naylor, and Miss Mo Kelly completed the order of finish. Lots o’ Lex and Lady Fog Horn were scratched. Walkabout, a homebred daughter of Stroll out of the Broad Brush mare Arlucea, notched her fourth win in 11 starts and improved her career earnings to $219,033. Last year, she finished fifth in the Grade 2 Indiana Oaks and the Remington Park Oaks before a third-place finish against elders in the Grade 2 Falls City Handicap at Churchill Downs. The Matron was staged for the 80th time, but this was the first renewal at the Louisville racetrack. The race would have gone on hiatus in 2017 if Churchill Downs Racetrack didn’t step up to host the important Midwest race for fillies and mares. Previously, it was staged at its sister track, Arlington Park, near Chicago. Walkabout returned $12, $5.40, and $4. Improv brought back $20 and $10.60, while Divine Elegance paid $8.80 to show.